This is the first in a series of dodgy mid to late nineties bootlegs that I have taken from my collection and am posting up here for you guys to enjoy. 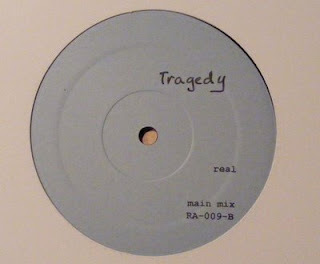 This 12" was picked up from either Mr Bongo's or Deal Real in London's west end in probably about late 1996 or early 1997. At that time you couldn't go into a London record shop without finding some sort of dodgy bootleg hip hop 12" or another. This one features two songs from Tragedy the QB legend. 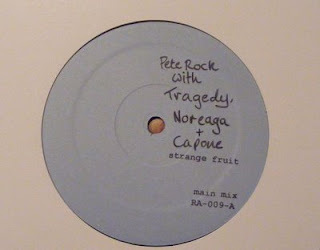 The first track is Strange Fruit which is a Pete Rock produced track featuring Capone and Noreaga. Another version of this track would later appear on Pete's first solo album Soul Survivor with an altrer line up of Tragedy, Pete Rock , Cappadonna and Sticky Fingaz. 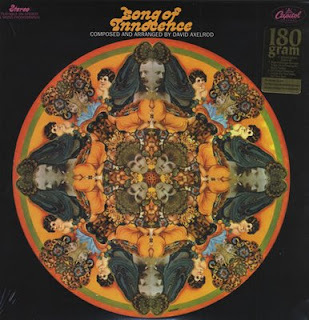 Fo this track Pete samples the creative genius of David Axelrod. The track he uses is called Smile and is taken from his 1968 album Songs of innocence. The B Side is simply called Real and thanks to my man Zingama who informs me that this track is produced by the dope Tokyo producer Dj Krush. I have no idea who produced it but I think its using the Skull Snaps drums, but I could be wrong. Chekc the link below for the vinyl rips of the bootleg and the Axelrod sample.